Youtel opens up a world of new experiences for young people. Whether it's a school trip, a club excursion or just friends travelling together, it's the perfect choice for group accommodation in Germany. The Youtel philosophy is simple. We deliver excellent service in a safe, secure hostel tuned to the needs of young people. We also cater for adults and our rates are astonishingly low. 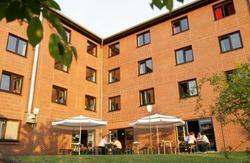 In 2007, Youtel became the first youth hostel in Germany to meet the quality criteria set out by Reisenetz, the German Youth Travel Association. - Courtesy lounge for teachers and group leaders with telephone, internet, coffee/tea etc. Breakfast not inclusive - 4.90 Eur / p.p. Bed Linen: 3.80 Eur / p.p.